Bernadette Peneles is a Breton viticulturist living in Skingrad who is employed at Tamika's Vineyards. She is also the object of the delusions of a paranoid Wood Elf, namely Glarthir. She sleeps in her house between midnight and 6am before walking the short distance to the Great Chapel of Julianos, where she prays in a pew for an hour. She then heads off to work hoeing Tamika's vineyard to the west of the city until 11am, when she takes lunch in the shelter to the southeast of the fields. At 1pm she finishes her lunch and goes back to work, this time in the yard behind Tamika's house. She eats dinner in the yard from 7pm until 9pm and then returns home, where she wanders around until bedtime. When it's a rainy day, she skips work and goes home right after her morning visit to the chapel. Bernadette wears normal lower-class clothing, a pair of coarse linens, a collared shirt, and oiled linen shoes and carries a tiny amount of gold. The only other item of interest on her person is her house key, although she does carry a respawning bread loaf, which means she always has food with her for her meals. Bernadette is happy in her life. When she greets you she will announce, "I'm Bernadette Peneles. I work for Tamika. I grow grapes. For her wines." When asked about the city in which she lives, her response is, "I've lived here all my life. Grown grapes. It's all I know. Fresh air, mountains, the grapes on the vine. It's just... beautiful." Other residents of Skingrad appreciate her efforts on Tamika's behalf and will say, "I think Bernadette Peneles seems like a nice woman. I know she works tirelessly over at the Tamika Vineyards." They'll also tell you that "Bernadette Peneles works over at the Tamika Winery. They make a quality wine there." Unfortunately, there is trouble brewing in her life as a paranoid wood elf is convinced she is plotting against him. Bernadette has realized that something is amiss and when asked about Glarthir will say, "Well, I know he's a bit odd, but I've always thought he was kind of sweet. Lately, though, he has been stranger than usual. I think maybe he's been following me. I see him every morning on my way to Chapel. I've tried to say hello but he always pretends not to hear me." The situation is left for the player to resolve. If you deem Bernadette guilty, she will be added to his List of Death. If you confront her with the list in hand she will get quite nervous: "You look concerned. Is there something you want to tell me about Glarthir?" When you show her the list she will be terrified: "Julianos preserve us! I can't believe it ... why me?! Please, show this to the guards right away!" If you ask her about Glarthir again she will add: "Thank you for warning me about him. Please, hurry and tell the guards before it's too late!" 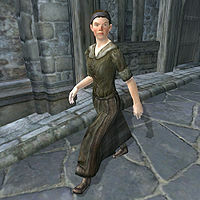 If, however, you decide to reject Glarthir’s note, Bernadette will join the People Glarthir Hates faction and will soon be attacked in her sleep by a wood elf armed with an iron war axe. If Glarthir succeeds, the upset townsfolk will start to say: "Hadn't you heard? He went crazy and killed Bernadette Peneles, poor girl." During her afternoon stint in Tamika's yard she can be seen hoeing the path because her action marker is not in the right place. Esta página foi modificada pela última vez à(s) 00h51min de 13 de novembro de 2015.